Over the years, I have covered athletes who have sports backgrounds -- parents and kids. But Brookfield's Mierow family has something special going for them. Jeff and Cathy Mierow met while attending the University of Wisconsin - Whitewater. All three of their children - Cara, Mike and Kate - have had successful athletic careers for the Warhawks. But Mike, who was a catcher on the baseball team, and Kate, a current member of the gymnastics team, did something that was unique - both were members of National Championship teams. "It's an awesome feeling," Kate said of the brother-sister accomplishment. "I absolutely loved it." Of course, she was also excited about winning the national title as a team. "It was the coolest feeling ever," she said. "All the practice all season; we have fun because we love it. It was really cool." The next day she earned second-team All-American honors by tying for seventh on the uneven parallel bars at the individual finals. "It took a lot of hard work to get there," she said. "A lot of hours of practice. To show it off on Friday and Saturday was really cool." Mike was especially happy for his sister's success, not only winning the national team title but also making second-team All-American. "It was definitely special, especially because of all the injuries she battled through. I was a proud brother." Submitted Photo - University of Wisconsin - Whitewater --- Kate Mierow's Warhawk gymnastics team won National Title in March and she was second-team All-American. Cathy, Kate's mom, was a gymnast in high school and didn't miss a high school meet. She got Kate started in gymnastics when she was 2-3 years old. She was a member of the Salto Gymnastics Club in high school, but did diving for the swimming team at Brookfield Central and made it to state several times. Her favorite events in gymnastics were the bars and floor, especially enjoying the latter. "You got to pick your own music, use your favorite songs. It was your own event," Kate explained. Kate was the WIAC balance beam champion and a national qualifier in the beam as a freshman during Mike's final year at UW-Whitewater. Did her freshman success surprise her? "Yes, at the beginning of season I broke one rib on the bars and missed a month and a half," she said. "I participated at conference and finished first in the balance beam." So how much did it help her confidence going into her sophomore year? "It boosted my confidence a lot because of the injuries," she recalled. It did help and my teammates were also supportive." Her sophomore year she tied for 15th in the balance beam in WIAC Championships while competing in the uneven bars, her favorite event, as well. She also earned her second straight WIAC Scholastic Honor Roll recognition and Scholastic All-American recognition for the first time. 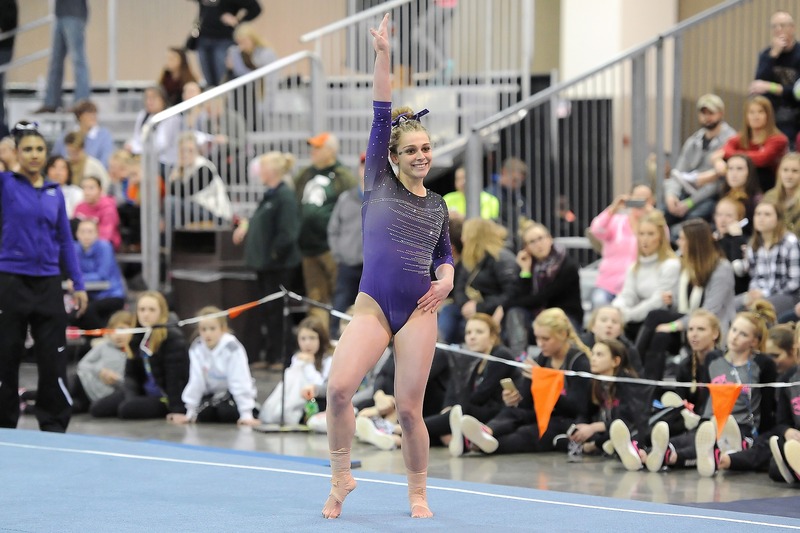 This season as a junior she earned two All-WIAC honors for her fourth place finish on uneven parallel bars (9.575) and a tie for third (9.75) for her floor exercise routine at WIAC Championships on March 17. Then she won the floor exercise in the team portion of the National Collegiate Gymnastics Association Team Championship on March 31 with a 9.7 score to contribute to the gymnastics team's first national title since 2014. She earned second-team All-American honors by tying for seventh on the uneven parallel bars (9.575) at NGCA Individual finals the next day. Big brother Mike, who graduated in 2015, won a national baseball title in 2014. In that championship season, Mike hit .346 with 32 RBIs and 15 SBs, as he started started 43 games behind the plate. He started a 7-0 win over Emory University in World Series final in Appleton. Jeff said that 2014 was an amazing year, as his former Brookfield Central team won the 2014 WIAA State Championship. His father, Jeff, was an assistant coach, and it was Kate's senior year in high school. 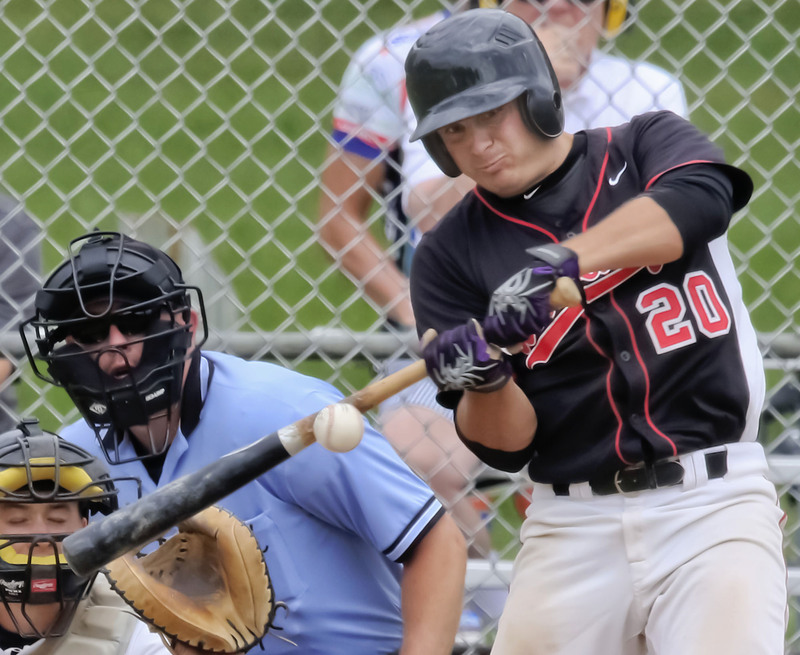 Mike earned first-team WIAC nominations two straight years, second-team D3baseball.com All-Midwest Region in 2014 and third team All-Midwest Region in 2015. "(2014) was an awesome as the year before we had a tough loss in 2013," Mike recalled. "We lost a ton of guys, so we needed guys stepping up and it was a cool process to go through." Photo by David Haberkorn --- Mike Mierow's Warhawk baseball team won the National Title in 2014. Mike said that he was a better catcher than a hitter when he came to UW-Whitewater so he was gray-shirted gray-shirted (sat out a year). "We had 100 kids, 15 freshman, and we all worked out in the fall, winter and spring. Two guys made the team. So the rest of us all hung around and worked together. That ended up being the core group in 2014. "My freshman year I started 75% of the games in right field, probably caught less than 5 games. My sophomore year I caught most of the games, but the team average was about .340 and I hit about .200. You have one bad game and it turns into a bad week. It turned into more of a mental game. I never struggled hitting like that in my entire life. But the team was awesome, so that made it a little bit easier." The next year Mike changed his mental approach. "I knew I would have games were I go 0-for-4, but I couldn't make it turn into a 1-for-16. But it's all about winning. Whether I hit .200 or .600, winning is what's important." Both Mike, Kate and Cara had a great support group, not only among themselves, but from their parents. "We always tried to watch each others sports," Mike said about growing up. "Believe it or not, Cara was the best baseball player in the family. She gave it up when she was 11 or 12 and started participating in dancing. "If you had a bad game, you always had a sister, who had a bad game or had a bad competition who you could talk to." Cara, 2 1/2 years older than Mike, 25, was a senior when Mike was a sophomore. She was a member of the Lancerettes Dance Team and is currently an assistant coach there. She was also a member of the Warhawks Dance Team and performed at halftime of the football team's 4 National Championship games. Cara is getting married in the fall to a University of Maryland lacrosse player, who she met at Next Level, where she works part-time. "She's only 5-foot, 2 inches, but she was doing some power lifting stuff," Mike said, the proud brother showing through. When asked about his relationship with Kate, Mike told a story about when he was 16 years old and he was told to pick up his sister at gymnastics practice. The coach called and said she got hurt on the balance beam and he needed to take her to the hospital. "She broke her shin bone, fractured it half way across and all the way down," Mike said. "I gained a lot of respect for her that day." But then respect is something that is not unusual for the Mierow family.